This post introduces Digital APUSH: Revealing History with Chronicling America, a web project I built with the help of fifteen AP U.S. History students in 2016. 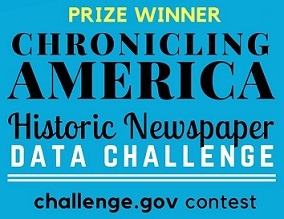 The project was recognized by the National Endowment for the Humanities, winning the K-12 prize in the agency’s nationwide historic newspaper data challenge. Besides traveling to DC with a student to present the project to members of NEH and the Library of Congress, I wrote about my students and their work for the NEH website.